At Crossroads Family Eyecare, Dr. Paul Smith and our entire team of professionals are committed to providing advanced vision care in a professional and comfortable environment. Our primary eye care service includes a complete eye exam that analyzes eye health and vision function. In addition to eye exams and vision testing, Dr. Smith and our team of professionals provide testing for glaucoma, cataracts and macular degeneration. Dr. Smith also offers glasses, contact lenses, and pre- and post-operative care. At Crossroads Family Eyecare, we strive to provide comprehensive, primary eye care for the whole family. Preventative and routine eye exams are important to maintaining good eye health. Often, eye and vision problems do not have obvious symptoms or signs, but are easily diagnosed by a licensed Optometrist. By diagnosing eye and vision conditions early on, our Optometrist is able provide treatment options and in many cases restore or prevent vision loss. The American Optometric Association recommends yearly or bi-yearly eye and vision exams, depending on whether you are at-risk or not. During an eye exam, Dr. Paul Smith will ask you questions about any symptoms or issues you are experiencing, medications your are currently taking, any blurry vision, your work environment, and your overall health. Family history and previous eye or vision conditions will also be discussed during this part of the examination. Dr. Smith will consider this information when determining any treatments or recommendations. Regular vision testing and evaluations ensure that you always have the clearest vision possible. Dr. Smith provides regular vision acuity testing as part of a comprehensive eye exam. He will measure how each eye is seeing by using a wall eye chart and a reading eye chart. The results of these tests are portrayed as a fraction, with 20/20 being the standard for normal distance and reading vision. Depending on the results of your vision test, Dr. Smith may prescribe corrective glasses, contacts, or eye exercises. In addition to vision testing, an eye exam in our Perry office includes testing eye functionality. Our Optometrist performs several tests to evaluate depth perception, color vision, eye muscle capabilities, peripheral vision, and responsiveness to light. Several other simple tests are completed to determine whether the eyes are focusing, moving, and working together properly. The test results enable Dr. Smith to diagnose any underlying conditions that may be impairing the eyes ability to focus or work together. As part of a comprehensive eye exam, our Optometrist examines the overall health of the eye through a visual examination and tonometry. Dr. Smith evaluates eye health by visually inspecting the eye and eyelids using magnification and a bright light. To examine the internal structures of the eye, we may dilate the pupils. Increased eye pressure may be an indicator of glaucoma, so we utilize tonometry to measure eye pressure. After completing these short tests, Dr. Smith reviews the results and discusses any necessary treatment options with you. Contact us at 478-224-1414 today to schedule a comprehensive eye exam. 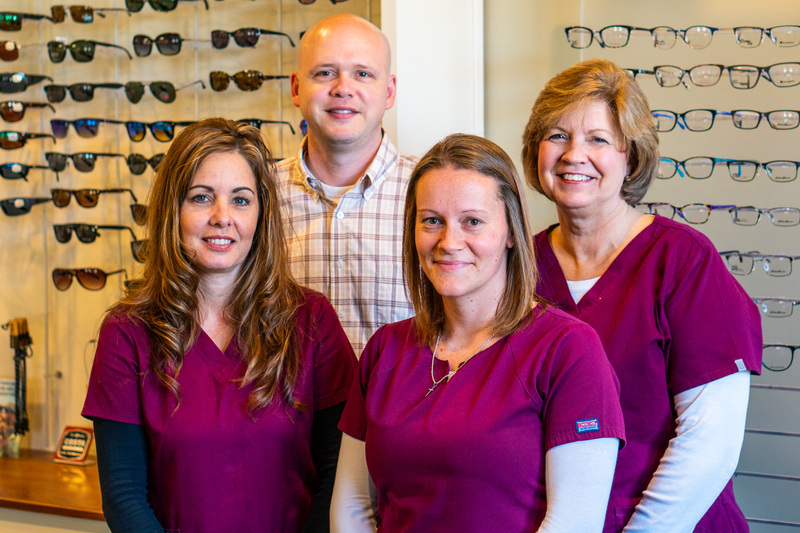 At Crossroads Family Eyecare, we strive to meet all of your eye and vision care needs. Corrective lens evaluations and prescription management are provided by Dr. Smith. After a comprehensive eye and vision evaluation, he will discuss the variety of contact lens options with you to select the type that best fits your vision needs and lifestyle. If you suffer from dry eye, allergies, or recurring eye infections, speak with our staff to determine whether contact lenses are right for you. Prior to prescribing contact lenses, Dr. Smith determines what level of vision correction you require. Refractive error (commonly known as nearsightedness, farsightedness, or astigmatism depending on the error) is evaluated by measuring how the eyes focus when a series of different lenses are placed in front of them. He may use either a phoropter or an automated instrument to take these measurements. To schedule an appointment for a vision evaluation with Dr. Smith, call 478-224-1414 today. After determining the level of refractive error, Dr. Smith works with you to determine whether contact lenses or glasses are best for your lifestyle. If you suffer from certain conditions, such as dry eye or allergies, glasses may be the most comfortable corrective solution. Contact lenses are available in either soft or rigid gas permeable form. Contact lenses need to be changed daily, weekly, bi-weekly, or monthly, depending on what type of lens you select. Specialized contact lenses, such as bifocal contact lenses, are also available for patients with special eye conditions. Call us at 478-224-1414 if you are interested in learning if contact lenses are a good fit for you. Advances in contact lens technology have created great options for cosmetic and prosthetic lenses. Custom contact lenses can be created to camouflage any color variation or irregularity and produce a natural eye color. Cosmetic lenses are also available to transform your eye color. Call us at 478-224-1414 and speak to our knowledgeable staff if you are interested in modifying or changing your eye color with contact lenses. All frames are warrantied for one (1) year from purchase date. *Frames are warrantied against manufacturer’s defects and any breakage or damage caused by normal wear and tear. Simply return broken frame and/or pieces, and we will repair or replace as needed. Note: Lost or stolen frames are not covered under warranty. If for any reason you cannot adapt to your PROGRESSIVE lenses, bring them back within sixty (60) days of normal pickup and we will replace them one time, at no charge, for equal or lesser value. Any upgrades or add-ons to the lenses will be an additional charge. For a period of two years from normal pickup, lenses that have an anti-reflective coating (ARC), will be warrantied against peeling or crazing. Lenses will be replaced with new Anti-Reflective with the same material, frame style, and prescription, at no charge. Patients must be advised, when using your own frame, we cannot accept responsibility or liability for breakage, damage, or loss to your frame during the insertion of your lenses. If your frame is damaged during this process, the patient is responsible for supplying a new frame, and we will provide you with new lenses at equal or lesser value. Overtime, your glasses will get out of alignment. Please come by our office any time, for the lifetime of your glasses, for a readjustment and cleaning. We also offer free screw and nose pad replacements! Since your eyeglasses are custom-made for your prescription, there will be no refunds, and all deposits made will be forfeited once your order(s) have been processed by the lab. * Normal pickup is 7 to 10 business days from purchase. In some cases, this can be revised due to speed of service from our lab. * Frame and lens warranties are only warrantied against normal wear and tear and manufacturer’s defects. All warranties are void against super glue, pet chews, or driving over them. * Glasses made by your insurance company’s lab adhere to different guidelines. Please refer to your insurance manual for details. Are you ready to schedule an appointment? Have a question for us? Want to know if your glasses or contacts are ready for pickup?